One of the most challenging parts about being a landlord is having to deal with evictions. Many independent landlords are often left confused on exactly how to evict a tenant in Las Vegas. Las Vegas is a hot rental market, which means that there are an abundance of pre-qualified Las Vegas renters hoping to find their ideal rental vacancy. If you have a problematic tenant that consistently does not pay rent, causes damage to the property, or violates the terms of your lease, it may be time for an eviction. Read on below to learn how to evict a tenant in Las Vegas the correct way. All of these tactics are considered illegal under Nevada law and should be avoided. Although you feel you may be successful at getting the tenant to leave more quickly this way, you are breaking the law if you use any of the above outlined tactics. Once you have a firm grasp on Nevada & Las Vegas eviction laws, you’ll want to make sure the reasoning behind the eviction is valid. Most evictions happen because a tenant has become past-due on their rent. You must go by the terms stipulated in the lease. You do not have to give a grace period to the tenant. If the tenant has failed to pay rent or has not complied with the terms of your lease, you have a legal right to pursue an eviction. If you are unsure if your reason for wanting to evict a tenant is valid, consulting/hiring a reputable Las Vegas eviction services company is the best route to take in order to ensure you are going about the eviction process in the correct legal manner. If you plan to go forward with the eviction, it’s essential to organize any documents, receipts, or other evidence you have to support your reason for wanting to evict the tenant. This can include proof of late rent payments or failure to pay rent, images of damage done to the property, written complaints from other tenants, or surveillance footage of illegal activities performed by the tenant on the property. The more you have to support the reason for an eviction, the better. Keep in mind that each case is unique, and there are going to be many scenarios that come into play. People are going to fall on hard times, and unforeseen events can make paying rent on the first of the month impossible. If the tenant cannot pay at that point, then they may call you to ask for an extension. However, just because a verbal agreement is made doesn’t mean that you shouldn’t issue a notice. You don’t want to waste any more time if they should fail to hold up their end of the deal. If they don’t come through with the payment, then you should consider proceeding with the eviction. The clock starts ticking as soon as you place the notice on the tenant’s door or in their hands. This time does not include the day of service and only includes judicial days, so it’s important to know what jurisdiction your property is in. Each jurisdiction has different rules regarding the proper day count. It’s also extremely important to make sure to always have a witness present to verify that you posted the notice on the door or gave it to an adult present at the property, unless the named tenant signs for the notice themselves. If the named tenant does not sign for the notice, additional steps are required. If you find yourself stuck at this stage, the best route to take is to hire a Las Vegas eviction services professional to help you with the process the rest of the way. As we previously listed in our how landlords can avoid delaying evictions piece, these are vital steps that need to be taken in order to assure there are no unnecessary delays during the eviction process. If the tenant does not comply with your notice within the time allowed, you can move to the next step in the Las Vegas eviction process, which would be filing a Summary Eviction with the court. A Summary Eviction will get the property back in your possession, but must be reviewed, signed, and executed by either the judge or hearing master, depending on the jurisdiction. If the tenant filed an ‘Answer’ to your notice, the Justice Court will schedule a hearing which you (the landlord) must attend to prevent the eviction from being denied. If an Eviction Order is granted, the tenant will have a chance to file a Motion to Stay or a Motion to Set Aside an Eviction Order. Depending on the hearing master’s discretion, you and the tenant may be notified to appear in court. If no motion is granted, the Order from the court will be passed on to the authorities to finalize the eviction. The official Notice to Vacate is posted and the lockout will be scheduled for the next business day. The county deputy will contact you to schedule a specific time for the lockout. As you can see, the eviction process is quite detailed and can get a bit complicated. 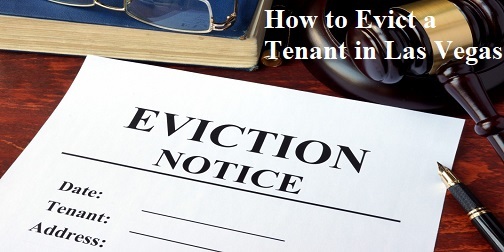 It is important to know the proper way on how to evict a tenant in Las Vegas for all landlords renting out property in the area. There will always be those difficult tenants and situations that you will require professional assistance in handling. Property owners in Las Vegas need to ensure that they follow the state’s procedure to evict correctly, as landlords definitely don’t want anything to come back on them in the end, costing them more money than necessary. Whatever the case or situation, enlisting the aid of a reputable, experienced Las Vegas Eviction Services company is always the safest and most secure route to take in order to assure that the eviction process goes as smoothly as possible.